You may know him from Peanuts as the German flying ace who always got the best of Snoopy. Perhaps you’ve seen him portrayed as an almost supernaturally skilled war pilot in movies and games reenacting the sky battles of World War I. Some 100 years after his bright-red triplane was shot out of the sky in the waning days of the Great War, the Red Baron has become a glorified symbol of frightening fighting efficiency. According to an Illinois history professor, however, the almost mythological status achieved by the Red Baron—whose real name was Manfred von Richthofen—obscures the disturbing reality of the man’s accomplishments. In fact, it wasn’t just changing times and modern culture that glorified the Red Baron’s image. The process started during the war itself. Desperate to raise war bonds, the countries involved in the conflict turned the object of pilots’ nightmares into fuel for the wartime propaganda machine and mythologized the aerial dogfights as equally-matched duels between modern-day knights. The reality of the dogfights, according to professor Peter Fritzsche, was far less noble. Von Richthofen shot down 80 enemy planes in the course of the war, mostly by hunting down slow-moving two-seaters, shooting their gas tanks from behind, and burning the pilots and gunners to death inside their cockpits. “It's pretty gruesome. Most of his kills were that way. It was the most efficient way to kill, and that's what he (von Richthofen) did. That was the business after 1916 — flying in squadrons collectively. No solo. Go for the most vulnerable planes. No chivalry there,” Fritzsche said. The Red Baron pioneered ruthlessly effective tactics, Fritzsche said. He abandoned aerial tricks favored by many pilots, and began flying in squadrons to hunt down his prey, aiming primarily for bigger, less-agile planes. His reign came to an end on April 21, 1918, when, at age 25, von Richthofen’s plane went down in northern France. The identity of the person who delivered the shot that killed him is still a mystery, and conflicting eyewitness accounts point to either a Canadian pilot or an Australian anti-aircraft machine-gunner. However, von Richthofen’s legacy didn’t end in 1918. His success would turn him into a character in Charles Schulz’s cartoons. 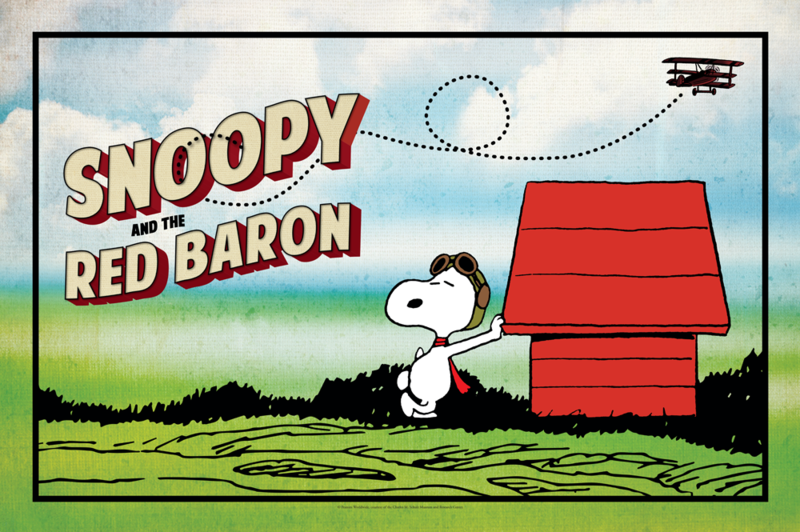 Donning a leather flying cap and piloting his doghouse, Snoopy and his perpetually ill-fated fights with the Red Baron began as lighthearted images in the comics sections during the 1960s, but they eventually became a symbol of the plight facing members of the military. Schulz, not wanting to take sides in the heated politics of the war, halted the Red Baron cartoons, but the link between the Red Baron and the face of war itself had already been drawn. Fritzsche discussed the topic earlier this year at the Elmhurst History Museum to a crowd filled to capacity with history buffs during the national debut of the Snoopy and the Red Baron exhibit from the Santa Rosa, California-based Charles M. Schulz Museum and Research Center. Fritzsche presented a slide lecture entitled The Real Red Baron: Manfred von Richtofen & the WWI Aviators. The tactics von Richthofen engineered not only changed the aerial landscape of WWI — his trademark efficiency and ruthlessness would foreshadow the mentality of the Nazis long before becoming fodder for Charles Schulz’s cartoons, Fritzsche said. Hermann Göring, the last commander of the Flying Circus, a wing of the German air force led by von Richthofen before his death, would re-emerge in World War II as the second most powerful man in the Nazi regime. “You can see this incipient world of the squadron in 1918 as an anticipation of the Nazis themselves, with their brutal tactics and no chivalry, and all of that,” Fritzsche said. Göring, who would go on to found the Gestapo and help dismantle the democratic Weimar Republic, was chosen to replace von Richthofen as commander of the Flying Circus’s squadrons for the values von Richthofen valued most. We are pleased to share the outcome of the search for the Susan Welch Dean of the Pennsylvania State University College of the Liberal Arts. Dr.
You may know him from Peanuts as the German flying ace who always got the best of Snoopy. Perhaps you’ve seen him portrayed as an almost supernaturally skilled war pilot in movies and games reenacting the sky battles of World War I. What does Brazil’s recent election mean for its future? Illinois history professor Jerry Davila specializes in the study of 20th-century Brazil. He also directs the Lemann Institute for Brazilian Studies at the U. of I.